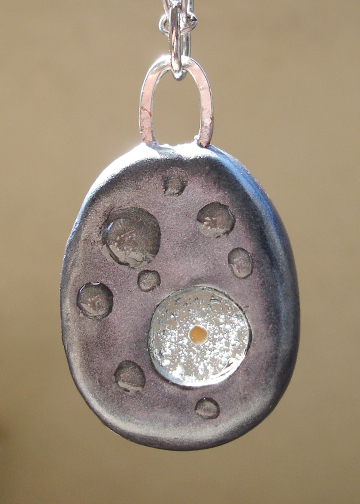 Earlier this year, a friend of mine commissioned me to create a couple of mustard seed pendants to give as gifts. You can see them here. She liked the pendants so much that she asked if I could create another pendant to give as a birthday gift for her daughter! For her daughter’s pendant, she requested that it be another round version, but with a silver metallic finish instead of the gold I had done originally. It is basically the same design as the round gold pendant except I used components that matched the silver finish she requested. As usual, I harvest pieces and components from jewelry I already have on hand, or make them from wire. In this case I took a link off of a large silver chain and wrapped it with wire to create a bail. 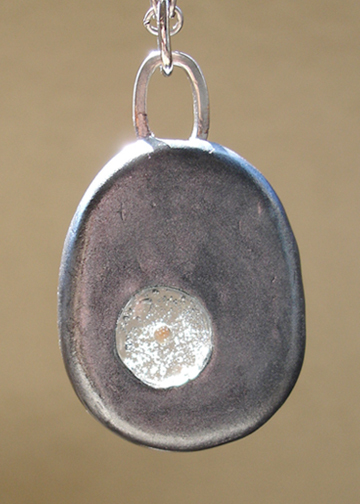 The pendant itself is polymer clay dusted with silver metallic powder. 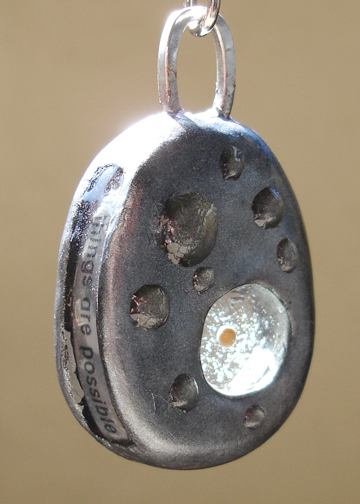 A channel was carved into the side of the pendant so that the text could be inlaid then encased in clear resin. This time I lined the bottom of the channel with white polymer clay so that the text would show more clearly once the resin was used. 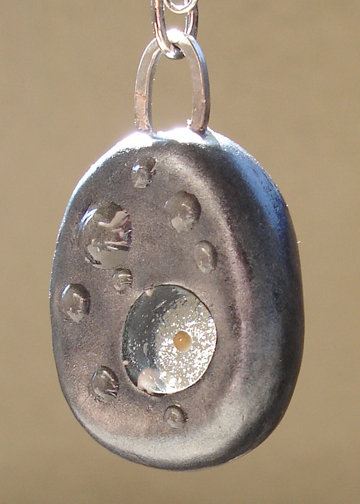 A round hole was cut into the pendant then filled with clear resin in layers. This allowed me to float the single mustard seed inside the resin. Here are a couple more shots that show more angles. I received an email from my friend the day after she gave her daughter the pendant. She said her daughter really loved it and thought it was extra special since her mom had come up with an idea for a special gift, and that she knew that I had actually handcrafted it especially for her. It felt great knowing that it held special meaning for her and that she really liked her birthday gift! Very neat! I am sure her daughter is going to love it! Thanks, Frankie! Yeah…I know. I’ve been lax. You’ve been doing a much better job than I have, that’s for sure. Nice blog you got there! It’s a Pam Yoshino original! That’s pretty cool don’t you think? Hi Brian! I hope you liked it! I guess it is an original, isn’t it!? Well, it’s actually just like an earlier piece that was more of a gold metallic…but I understand what you mean. 😉 Thanks!